Company files Notice of Intent to drill eight uranium exploration boreholes and two ground water monitoring wells; Colorado mining regulators find notice to be incomplete; will NOI be approved despite problems with 2007 exploration drilling? Apparently the Centennial Project is not big enough. On June 24, Powertech Vice President Richard Blubaugh filed a Notice of Intent (NOI) to Conduct Prospecting with the Colorado Division of Reclamation, Mining and Safety. Powertech proposes to drill eight exploration boreholes and two ground water monitoring wells in an unspecified area six miles west of Nunn. The boreholes would range from 160-900 feet deep. Under a previous NOI submitted in mid-2007, Powertech drilled 20 exploration boreholes and three monitoring wells, and "rehabilitated" 26 exploration holes originally drilled by Rocky Mountain Energy in the late 1970s and early 1980s (see photo at right). Details of this prospecting effort are considered confidential in accordance with state law in effect at the time. 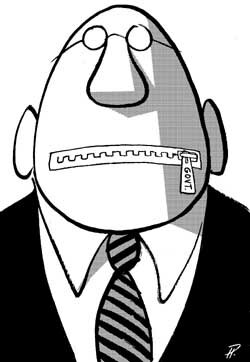 On June 2, 2008, Governor Ritter signed Senate Bill 228, which begins to lift the veil of secrecy surrounding NOIs. However, the law is vague and implementing rules have not been drafted, so determining what information is confidential and what is not is a topic for debate. You have placed the details of the proposed ground water monitoring wells in the confidential section of the NOI. Please provide your reasoning and rationale in terms of SB 228 for excluding this information from the public record. 2. The concentration of natural uranium in soil with no radioactive decay products present may not exceed the background level by more than 30 pCi/g or 1.11 Bq/g, averaged over the top 15 cm of soil below the surface; and 15O pCi/g or 5.55 Bq/g, average concentration at depths greater than 15 cm below the surface, so that no individual member of the public will receive an effective dose equivalent in excess of 100 mrem per year or 1 millisievert (mSv) per year. The DRMS will require test results demonstrating that these limits have not been exceeded; the tests are to be conducted during or immediately following the reclamation of the mud pits. If these limits are exceeded, DRMS may require appropriate offsite disposal of mud pit contents. According to state rules, Powertech has sixty days from the date of the letter to address the issues raised. Otherwise, the DRMS may terminate the NOI. Open pit issue driving new exploration? This latest NOI may be an effort by Powertech to identify additional uranium deposits in order to enhance the viability of the Centennial Project. Because of intense opposition to early plans by Powertech to conduct open pit mining on the southern portion, at least one company official has said mining permits for the southern area would not be sought at this time. The uranium deposits in the southern portion are shallow (85-125 feet below the surface) and located above the water table, and would typically be extracted by open pit mining. In-situ leach mining is not feasible in unsaturated rock formations. The problem for Powertech is that the southern portion contains over 60% of the project's 9.7 million pounds of identified uranium, according to a consultant's report. The northern area, slated for in-situ leaching, has only 3.8 million pounds. At the current uranium spot price of $64.50 a pound, and factoring in carrying costs, permitting costs, development and production costs, aquifer restoration and land reclamation costs, royalties, executive compensation, overhead, and the fact that typically only 70-80% of the uranium is economically recoverable, the northern area by itself might be too small to be economically viable. The proposed exploration seems to be focused on the northern portion which has deeper, saturated orebodies that are more amenable to in-situ leach mining. Discovering more uranium in this area could potentially give the project a boost. 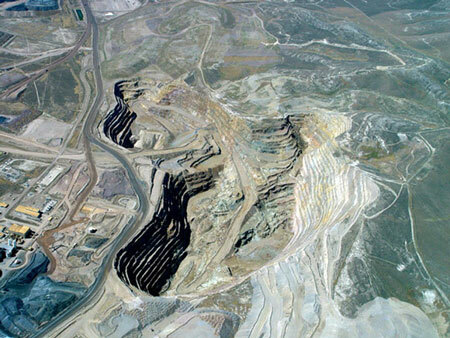 The photo above is of an open pit mine; the mine is not related to Powertech. Reports have come in that Powertech is engaged in ongoing efforts to persuade several landowners to sell both surface and mineral rights on several parcels adjacent to its existing holdings. While some of these parcels would allow Powertech to conduct additional exploration, others are needed for mining previously-identified uranium deposits. In addition to the area needed for production wellfields, adjacent land is required for monitoring wells. Environmental samples must be taken from an even larger area. Landowner cooperation has been mixed. While some have dealt with Powertech, others have refused to talk to the company and won't allow Powertech employees or contractors on their land. Acquisition of real estate and additional mineral rights in the project area has not come easy for the company. While a few landowners have sold out, many have been offered insultingly low offers for their property and have told Powertech to take a hike. According to reports by neighbors, one landowner whose home sits directly above a uranium deposit has so far been unwilling to sell his family's home and land despite repeated and persistent pleas by Powertech representatives. One longtime landowner wanted to sell a large parcel of land but did not want to sell to Powertech. An interested buyer backed out after being informed of Powertech's plans to mine uranium in the area. The landowner's real estate broker then brought a contract from a Denver-area broker representing a buyer who allegedly wanted to run cattle on the property. Both brokers assured the landowner the buyer had no connection to Powertech. After the contract was signed the landowner was informed that the buyer was in fact purchasing the land for Powertech. The deal has not yet been closed, and the landowner is understandably upset about being deceived. Prior to the June 2, 2008 enactment of Senate Bill 228, all NOIs and any information regarding NOIs (including even whether or not an NOI had been filed) were strictly confidential and not subject to Colorado open records laws. Colorado mining regulators strictly adhered to this law. In an October 12, 2007 letter from David Berry, Interim Director of the Mined Land Reclamation Office, to a concerned northern Colorado landowner seeking information she needed to protect her water supply, Mr. Berry pointed out that while he had a "statutory responsibility to protect the public health and safety" he would be subject to criminal misdemeanor charges for disclosing confidential information. Presumably, such information could include reports of spills, leaks, and releases of radionuclides and other toxic materials into ground water aquifers or the surface environment. So apparently under these confidentiality provisions a state official with knowledge of potential ground water contamination will not warn affected well owners for fear of being prosecuted. Under Senate Bill 228, a mining company filing an NOI must submit an electronic "non-confidential" copy that is to be posted on the DRMS website. A confidential version is submitted for staff review. The mining company may choose to redact much of the critical information on the non-confidential copy. Notably, the location of proposed drilling, borehole depths, and drilling methods can be designated as confidential and withheld from the public. With Powertech's June 24 NOI, the company followed its typical approach of concealing information from project stakeholders by designating its drilling maps and related borehole information as confidential. The NOI describes the proposed exploration drilling as being approximately six miles west of the town of Nunn. The Centennial Project is six miles west of Nunn. In recent weeks, residents of the area have noticed increased activity on Section 9, including the stockpiling of PVC pipe and the staging of drilling and construction equipment. Section 9 is bounded by Weld County Roads 108, 19, 106, and 17. Powertech has almost all of the known uranium deposits in the Centenial Project locked up by virtue of its contract with Anadarko Petroleum Corp. and the acquisition of land adjacent to the Anadarko holdings. So there does not appear to be any business reason for withholding the drilling maps, such as tipping off competitors. And with the firestorm of opposition to the Centennial Project, it seems unlikely that another uranium company would choose to compete with Powertech in this area of northern Colorado. Uranium drilling - a risk to aquifers? The location and depth of Powertech's proposed boreholes is, however, of interest to nearby water well owners who are concerned that current exploration drilling and potential in-situ leach mining may contaminate drinking water supplies. Uranium exploration drilling is not without risks. Just last month, the Wyoming Department of Environmental Quality issued a Notice of Violation to Strathmore Resources for multiple violations of its uranium exploration permit. 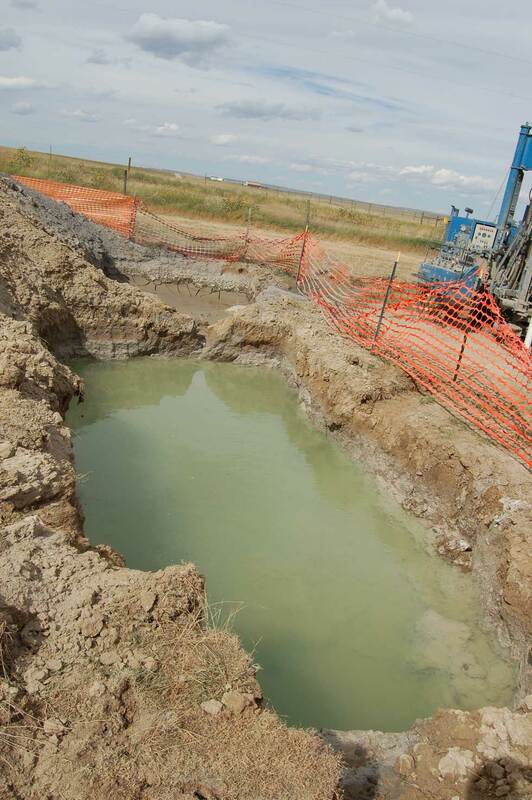 A state inspection of the Fremont County, Wyoming operation revealed violations such as uncapped drill holes, unsealed wells allowing potential pollution of ground water, and inadequate fencing of "mud pits" (large water-filled pits containing drill cuttings) allowing a calf to become trapped. Art Dohmann, president of the Goliad groundwater district, said the district has now tested more than 300 wells for contamination. Wells tested outside the uranium exploration area revealed minimal contamination, he said. But at least five wells near the area, and downstream as the aquifer flows, did have elevated contamination levels, he said. It’s possible that heavy rains forced surface contamination in through the exploratory boreholes and into the aquifer, Dohmann suggested. On March 26, 2007, the Texas Railroad Commission found 74 boreholes that were not properly sealed. Dohmann said a borehole is about 7 or 8 inches wide and stems 450 feet beneath surface soil and deep into the county’s aquifer. In early July, the Fremont County, Colorado commissioners placed conditions on uranium exploration by Australian company Black Range Minerals. The conditions include the requirement that the commissioners will hire an independent hydrogeologist to monitor surface and ground water throughout the exploration process. The hydrogeologist "will review, comment on and make recommendations about the adequacy of BRM’s water baseline monitoring program." The government of the province of New Brunswick, Canada recently banned uranium exploration and extraction "in designated watersheds and wellfields, as well as in villages, towns and cities." The July 4, 2008 inititative is intended "to better protect drinking water supplies." The Canadian province of British Columbia banned uranium exploration (and mining) in April of this year; Nova Scotia has banned uranium exploration since 1982. The Weld County government has so far not required any county review or approval of uranium exploration activities. 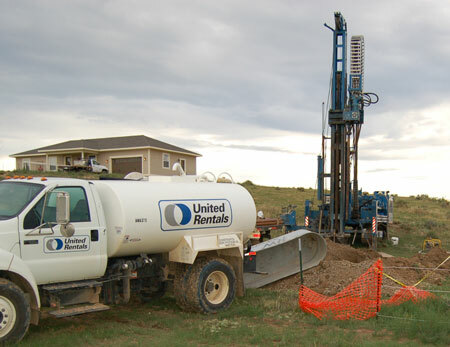 During 2007, Powertech drilled 23 wells and re-opened 26 abandoned wells drilled in the 1980s by Rocky Mountain Energy. This work was conducted under a Notice of Intent to Conduct Prospecting filed with the Colorado Division of Reclamation, Mining and Safety. At the time, all information related to NOIs was confidential, but a mining company could voluntarily disclose the information. Both local landowners and state mining officials requested that Powertech waive confidentiality. Even though Powertech refused to disclose its drilling locations, local residents couldn't miss the drilling rigs and construction equipment that began showing up next to their property. Thank you for your letter of July 16, 2007 concerning non-compliance at Powertech operations in the Weld County area. When the Division receives such an inquiry, we conduct an inspection within 30 days. However, all information contained in prospecting files (if such exist) are to remain confidential in accordance with CRS 34-32-113(3) of the Colorado Mined Land Reclamation Act. Therefore, any information or findings from conducting such an inspection, if it pertains to prospecting files, must remain confidential. Leaving these boreholes open for several days allowed for dirt, organic matter, and rodents to potentially enter the wells and contaminate the ground water aquifer. The two wells were originally drilled by Rocky Mountain Energy, and are located on the northeast corner of Weld County Roads 19 and 96. According to workers at the site, both wells are about 150 feet deep, and the water table is at 107 feet below the surface. The wells are in the southern portion of the Centennial Project. A more disturbing incident occurred later in the year. Powertech drilling crews were drilling on Section 9 just west of the County Road 19 right-of-way. The workers had dug a "mud pit", which is typical for uranium exploratory drilling. Excavated by a backhoe, a mud pit is roughly fifteen feet long, five to eight feet wide, and six to eight feet deep, and is filled with water. 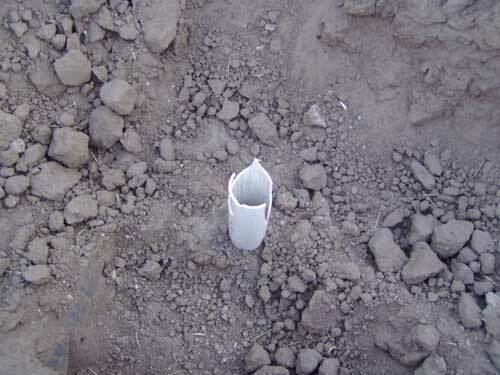 A mud pit provides the drilling fluid which carries the material excavated by the drill bit up to the surface. This material, referred to as "drill cuttings", contains mostly sand, shale, clay, and in the case of the Centennial Project, uranium and other radioactive materials. The drill cuttings are collected in the mud pit. Various chemicals are sometimes added to the drilling fluid to alter the fluid properties, based on the geology of the host rock and other conditions. Additives may include potassium chloride, defoamers, surfactants, wetting agents, diesel-oil, emulsifiers, polymers, biocides, bactericides, complexing agents, and heavy metals contained in pipe dope. The composition of the drilling fluid used by Powertech is unknown. This particular mud pit was unfenced for some period of time in violation of Colorado mining regulations. Two labrador retrievers owned by a family living near the drilling area somehow managed to fall into the mud pit and could not get out. The family's grandfather went searching for the dogs, found them in the pit, and in the process of trying to rescue the dogs he fell in. The family's teenage daughter had to help both the grandfather and dogs out of the mud pit. Fortunately, the water level was not very deep at the time. Notice the height and condition of the fence. The area has a large population of pronghorn antelope as well as mule deer, coyotes, jackrabbits, hawks, and domestic dogs. In a June 28, 2007 news release, Powertech announced that the state had approved its NOI to drill 23 exploration wells and rehabilitate 26 existing wells. Most of the wells to be rehabilitated were located in county road right-of-ways (ROWs). Within a week, local residents began seeing construction activity in the ROWs. On July 8, I emailed the director of the Weld County Department of Public Works asking if Powertech had pulled ROW Use Permits for these projects. A Public Works employee emailed back requesting information about the location of the wellheads. I provided GPS coordinates for one of the wells located on the side of County Road 96. Weld County never answered my question. A county employee did contact Powertech to discuss the ROW permit requirement. In a July 31 email from Powertech consultant George Robinson to a Weld County Public Works employee, Robinson asked "Are permits required to repair these wells? If permits are required how would you like us to proceed?" Robinson runs the highly-touted environmental consulting firm R Squared Inc. Robinson's firm was hired in part to identify and ensure compliance with all permitting requirements for the Centennial Project. On August 1, Powertech finally applied for a Right-of-Way Use Permit for work done on 15 wells. Much, if not all, of the work had already been completed. In fact, Powertech even submitted photos of some of the completed wells. The application shows a "Planned Start Date" of August 1 even though work commenced in early July. The ROW permit was issued by Weld County on August 8. Following Powertech's lead, the Weld County employee who prepared the permit showed the fictional start date of August 1. The permit also includes the statement that "Work may be covered under permits obtained in the 1980's." That's a long time to keep a permit open. For starting work without a permit, Powertech's application fee was doubled from $118.50 to $237.00. Under current Colorado statutes and mining regulations, a company such as Powertech can submit an Notice of Intent to Conduct Prospecting and obtain approval from the state to drill into drinking water aquifers in close proximity to existing domestic water wells. This prospecting activity may include searching for uranium as well as collecting data for mine permit applications. Water samples may be collected, and tests conducted to evaluate the characteristics of the aquifer. The company may use a variety of chemicals in its drilling fluid and mud pits, and may conduct water pumping tests. All information regarding the drilling process and subsequent aquifer testing can be kept secret from the public. The location and depth of the boreholes is confidential. If nearby residents complain of open drill holes or unfenced mud pits or any other unsafe or hazardous conditions, state employees may inspect the sites, but all inspection reports, violation notices, emails, letters, and hearing transcripts are considered confidential and exempt from open records laws. A non-confidential version of the NOI must be posted on the DRMS website. A technical "office review" of the notice is done by state regulators, but any information related to the review of confidential matters cannot be publicly disclosed. The Mined Land Reclamation Board does not review NOIs. There is no public hearing or any other opportunity for public review or comment. A DRMS staff approval of an NOI can't be appealed. Although DRMS staff must review and approve or deny an NOI, an NOI is not considered a "permit", according to the Colorado Attorney General's office. Classification as a permit would trigger legal requirements for public participation in the review process. POWERTECH URANIUM CORP. ("Powertech" or the "Company") is pleased to announce that it has completed field activities and has received chemical analyses from its drilling and coring program on the Centennial Project in Weld County, Colorado. This program was completed in the fall of 2007 and was authorized under a permit from the Colorado Department of Natural Resources' Division of Reclamation Mining and Safety (DRMS). Staff from the Division of Reclamation Mining and Safety has absolute authority over the types of activities that can be conducted under a prospecting notice and ... these decisions are not reviewable by any outside person, board or agency. Based on its past performance, Powertech has not shown due care for neighboring landowners, the ground water, or the environment. Compliance with state and county regulations has been questionable. Powertech has yet to mine a single pound of uranium (anywhere) and we can already see the careless approach the company has taken with its exploration activities. Current state law allows Powertech and mining regulators to conceal critical details about these prospecting activities. 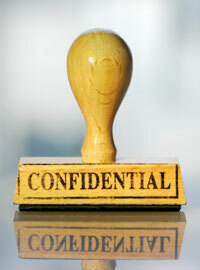 Powertech can choose to waive confidentiality and release this information. It should do so immediately.